Interest in the ground-breaking African American architect Robert R. Taylor continues to grow after the publication of Professor Ellen Weiss’s detailed biography of Taylor, and articles including two in Architect magazine. Weiss’s Robert R. Taylor and Tuskegee recounts Taylor’s life, side by side with striking photographs of Taylor’s architectural accomplishments as the first classically trained African American architect. Taylor was MIT’s first African American graduate in 1892, and soon after Booker T. Washington recruited Taylor to teach and design the campus of Washington’s Tuskegee Institute. “He had a classical French training at MIT,” Weiss told WWNO’s Fred Kasten on his The Sound of Books program, “and this shows in many overt ways like the correct use of columns, a very sensitive approach to proportion, to thickness of walls, to all the tactile and visual qualities of architecture and its material.” Washington wanted the architecture of Tuskegee Institute to reflect to both the outside world and to Tuskegee’s own students the capabilities of African Americans. In a Q&A that also appeared in Architect, Weiss suggests that Taylor’s most important or influential building was the Tuskegee Chapel. “At its dedication, a New Yorker said it was a ‘cathedral in the Black Belt,’ where blacks and whites could stand equal before God. The chapel burned down in 1957. Read more about Robert Taylor from Star News, Architect magazine, and the Encyclopedia of Alabama; Fred Kazen’s The Sound of Books is also available for listening online. Robert R. Taylor and Tuskegee: An African American Architect Designs for Booker T. Washington is available direct from NewSouth Books, Amazon, or your favorite bookstore. The Times-Register article “Southern Bound: Tuskegee architect finally gets his due,” by John Sledge, calls Weiss a “thorough researcher and a graceful writer who nicely balances Taylor’s personal and professional lives.” Indeed Weiss describes Taylor’s early life and includes both Taylor’s own letters, and writing about Taylor by his contemporaries, along with detailed accounts of the buildings that Taylor designed at Alabama’s Tuskegee Institute, later Tuskegee University. Many of those buildings are still in use. “I feel I know him,” Weiss told New York Times reporter Eve Kahn for the “Antiques” column, given the volume of documents Weiss studied related to Taylor. Weiss is also very good on the difficulties that black architects and tradesmen faced in a constricted society. Though extremely careful, Taylor did push for increased opportunities for minority professionals, and on at least one occasion he had to deal with a racist white tradesman. Like [Booker T.] Washington, Taylor remained relentlessly optimistic, though Weiss reveals that after 1919 when whites were viciously assaulting entire black neighborhoods, “he wrote privately that he could no longer assume that white people were fair minded.” It was a rare pessimistic comment from a man focused on work, family and surviving in a hostile world. But in finding that reference, Weiss has given us the whole man, in his glory and his despair. 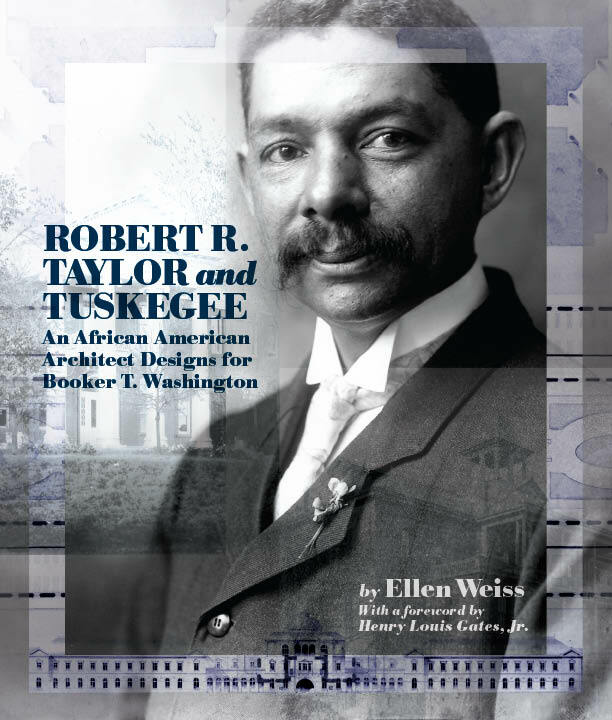 Ellen Weiss’s Robert R. Taylor and Tuskegee: An African American Architect Designs for Booker T. Washington is available from NewSouth Books, Amazon, or your favorite book retailer. At 300 pages and including over 100 photographs, including a full catalog of Taylor’s work at Tuskegee University, Weiss’s book will be of interest to social and architectural historians and the general reader alike. You are currently browsing the archives for the Robert Taylor category.